In the past year, the healthcare sector has seen a dramatic rise in the Health Insurance Portability and Accountability Act (HIPAA) enforcement, settlement agreements, and the resumption of the Office of Civil Rights audit protocol. The Office of Civil Rights was appointed as the enforcement arm for the HIPAA rules in 2009. The number of healthcare records that were breached in 2015 (113 million) was nearly triple the number of rec­ords breached between 2009 and 2014 (41 million); this, in addition to the unprecedented number of ransomware attacks the industry is facing this year, shines a spotlight on healthcare and the security of the information we house. 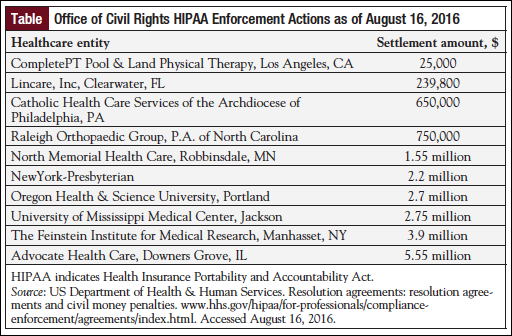 The numbers of resolution agreements, as well as the settlement amounts, speak volumes of the significance of entities complying with the HIPAA rules. More than 50% of the resolved investigations in 2016 involved a lack of security as it relates to patient information, and organization-wide risk analysis being conducted as is required by the HIPAA rules.1 In fact, in the majority of the cases, had the entity performed a thorough risk analysis and rectified any identified risks, the outcome of these investigations could have been considerably better. The Office of Civil Rights recently kicked off the next phase of their auditing protocol. On July 11, 2016, the Office of Civil Rights notified the current pool of auditees of their selection and submission requirements of HIPAA documentation.2 The good news is that if you did not receive a notification that you were selected and of your submission requirements, you can breathe easy for a few months; however, that does not mean that you will never be selected for auditing purposes by the Office of Civil Rights. Do You Have a Complete Compliance Program? As we consider the reality of HIPAA and the cybersecurity landscape for healthcare entities, it is clear that we must ensure we are meeting our responsibilities to protect the patient information we create, maintain, and store. One of the most important aspects of this is to make sure that you have a complete HIPAA compliance program in place. A complete program will involve third-party vendors to help establish policy and procedure, and information technology support to ensure that your technical environment is secure. Are these policies and procedures communicated to employees? Are they enforceable by rule? When was the last time you completed a HIPAA security risk assessment? When was the last time you completed a HIPAA risk analysis? Do you know the status of your network environment? If you answered no, or were unable to answer any of these questions with absolute certainty, make sure today is the day you begin to update your HIPAA compliance program. US Department of Health & Human Services. Resolution agreements: resolution agreements and civil money penalties. www.hhs.gov/hipaa/for-professionals/compliance-enforcement/agreements/index.html. Accessed August 16, 2016. US Department of Health & Human Services. HIPAA privacy, security, and breach notification audit program. www.hhs.gov/hipaa/for-professionals/compliance-enforcement/audit/. Accessed August 16, 2016. Lee S. Ransomware wreaking havoc in American and Canadian hospitals. Newsweek. March 23, 2016. http://www.newsweek.com/ransomware-wreaking-havoc-american-and-canadian-hospitals-439714. Accessed August 16, 2016. Zetter K. Why hospitals are the perfect targets for ransomware. Wired. March 30, 2016. www.wired.com/2016/03/ransomware-why-hospitals-are-the-perfect-targets/. Accessed August 16, 2016. Siwicki B. Ransomware attackers collect ransom from Kansas hospital, don’t unlock all the data, then demand more money. Healthcare IT News. May 23, 2016. www.healthcareitnews.com/news/kansas-hospital-hit-ransomware-pays-then-attackers-demand-second-ransom. Accessed August 16, 2016. Angela Simmons is a Consultant for Total Medical Compliance (TMC). TMC is a private consulting company providing programs and seminars for healthcare providers to achieve and maintain compliance with government safety and privacy regulations such as HIPAA, OSHA, and Infection Control. A TMC consultant works in partnership with the safety and privacy officers at your location to ensure all aspects of the regulations are addressed. TMC provides on-site employee training, customized compliance manuals, office inspections, and ongoing support with newsletters and customer service. For information on seminar schedules and products, visit www.TotalMedicalCompliance.com. For more information, call 888-862-6742 or e-mail Angela@totalmedical compliance.com.